Among the most impressive publications of Albanian writer, Sami bey Frashëri (1850-1904), is a 4,830-page Ottoman Turkish dictionary entitled “Kamus al-a’lam” (Universal Dictionary of History and Geography), published in Istanbul in the years 1889-1898. This dictionary contains numerous entries on the towns and regions of Kosova, as part of the Ottoman Empire, with its primarily Albanian population. This is one of the vilayets situated in the north of Roumelia [European Turkey]. It comprises the northeastern part of Arnautlluk [Albania] with Yeni Pazar [Novi Pazar] and the northeastern part of Macedonia, that is, the territory once known as Dardania. The Vilayet of Kosova borders to the north on Serbia and Bosnia, to the northwest on Montenegro, to the west on Shkodra, to the southwest on the Vilayet of Monastir [Bitola], to the southeast on the Vilayet of Salonica and to the east on Bulgaria. Most of the terrain is a plateau with some mountainous areas. Now, the plain of Skopje also forms part of the Vilayet of Kosova. The highest mountain range in Roumelia is the Sharr, that stretches southwest to northeast and ends at the Gorge of Kaçanik. It then continues with the Karadak [Crna Gora] mountains to the border of Serbia. There are also high mountains elsewhere along the borders and around the vilayet, in particular towards Montenegro and the Serb border. Some of these high mountains are arid and rocky, whereas others are covered in forests. The Sharr Mountains are arid and bare on the western side, but covered in various types of trees to the east, where there are also fair valleys. Many rivers flow from the mountains and, as mentioned above, the Vilayet of Kosova has three water basins. The first water basin is that of the Vardar which collects all the waters in the southern part of the vilayet. This river takes its source in the southern part of the Sharr Mountains that stretch eastwards, and flows trough a fair valley in an eastward direction. It passes through the centre of the vilayet, through Skopje, and collects, on its way, the rivers to the south of the plain of Kosova that pass through the Gorge of Kaçanik, taking the Lepenc river and many others with them, and continuing their flow southwards. It then passes through the Vilayet of Salonica and flows into the Sea of Islands [Aegean Sea]. Among the larger rivers in this vilayet is the Egri Su [Kriva river, tributary of the Pčinja]. The second water basin is that of the Morava into which flow the rivers in the northeast that pass through Serbia. The third is the Ibër river that passes through the northern portion of the vilayet and, taking with it many other rivers, flows into the Morava. The fourth water basin is that of the Black Drin that comes from the Sandjak of Dibra and joins the White Drin in the western part of that vilayet. The White Drin, that comes from the region of Peja and Gjakova, collects all the waters in the western part of the vilayet. The climate is generally very good, although the winters are very cold. The summers are mild. There are only a very few marshes. The northern and western parts, i.e. around Gjakova and the western slopes of the Sharr are stony and not fertile, whereas the other parts, especially the plain of Kosova and the southeastern part of the vilayet, are very fertile. They produce: wheat, barley, rye, oats, chickpeas, beans and other produce such as tobacco, hemp, grapes, vegetables, and many kinds of fruit. The Sandjak of Skopje is known for cotton, hashish and rice. Best known among the fruits are apples called “shqiptarka” that grow around Tetova. Good plums and apricots also grow on the plain of Kosova and in Yeni Pazar [Novi Pazar], whereas around Skopje, all the fruits are excellent. Skopje beans and Koçana rice are known for their high quality. In the northwest, they do not produce enough food, but in the rest of the vilayet there is sufficient produce to cover not only the needs of the inhabitants, but also export. There are many farm animals because they thrive in this terrain, having sufficient pastureland. They raise cows, sheep and goats, etc. and because these are known not only for their quantity, but also for their quality, they are also exported abroad. Among the products of the herding industry are: wool, hides, butter and cheese, etc. that are used to cover local needs and the rest is then exported abroad. The Vilayet of Kosova has many woodlands. Although there is great wealth to be had in the forests with many types of trees, there is a lack of roads and vehicles, so that the wood can only be used for construction and for firewood. The mountain areas are also very rich in minerals, but up to now they have not been exploited. They are also rich in mineral waters and mineral baths. There are also many wild animals: wolves, bears, foxes, boars and hares, etc. from the hides of which they make fur pelts, most of which are sold abroad. Among the types of local handicrafts are blacksmiths, silversmiths, tanners, shoemakers and others, and they fulfil the region’s needs. In Prizren they produce metal weapons and tools, and throughout the vilayet they produce carpets, rugs, and various blankets and hides. As stated above, the Vilayet of Kosova includes part of Arnautlluk [Albania], part of Macedonia and part of Bosnia. The population is also of various origins. As no census was taken for all the regions, we cannot yet say anything for sure about the number of inhabitants. Taking the population density in several parts of the vilayet into account, we can, however, estimate a population of about one million. Most of the inhabitants are Albanians, the exception being in the southeast part of the Sandjak of Skopje where there are Turks, Muslims and Christian Slavs. The territory of Yeni Pazar has a mixed population of Albanians and Bosnians. In Tashlidja [Plevlja] they are almost all Bosnians. The sandjaks with Albanians are Prizren, Peja, Prishtina and the northwestern part of the Sandjak of Skopje, the majority of whom are Muslims. Here and there, there are Catholics, but all of them are Albanians. There are few Orthodox, some of whom are Slavs. In some towns like Skopje, Prizren and Prishtina they can speak Turkish. According to the religious census, three-quarters of the population are Muslims and only one-quarter is Christian and others. The railway line that stretches from Salonika to Serbia and Europe, passes through the Sandjak of Skopje. The section of the railway line to Mitrovica passes through the Sandjak of Prishtina and has done much to promote the development of trade and commerce in the vilayet because roads and vehicles here are underdeveloped. The Vilayet of Kosova, as can be seen in the following table, is divided into six sandjaks, with 27 kaza and 16 nahiye. Including all the capitals, towns and villages, there are 3,120 settlements. Until the last war with Russia, the Vilayet of Kosova had its capital in Sofia and included the regions of Nish and Prishtina. After the war, Prishtina was made the capital of the vilayet, including Yeni Pazar. 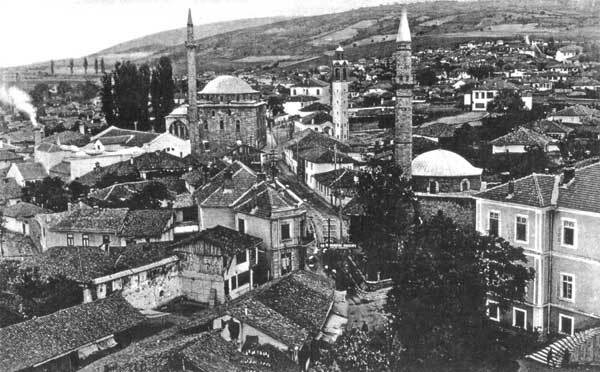 When the Sandjak of Prizren was removed from the Vilayet of Monastir and given to the Vilayet of Kosova and when Peja and the surrounding region became a sandjak of its own, Skopje became the capital of the vilayet. This is a broad plain that is situated in the western part of the Balkan peninsula, in Roumelia [European Turkey]. 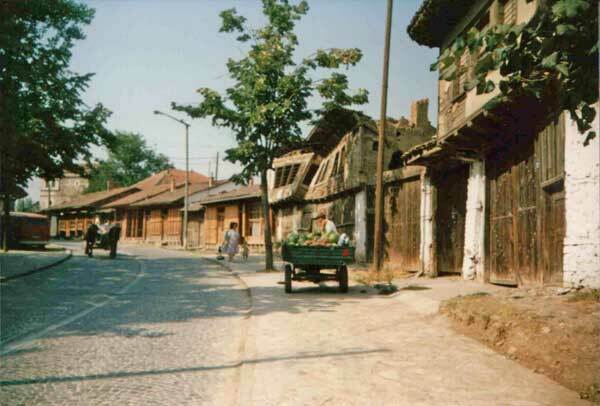 It is in the vilayet of the same name, between Kaçanik, Prishtina, Yeni Pazar [Novi Pazar], Peja, Gjakova and Prizren. It is at an altitude of approximately 500-600 m. The rivers that take their source here are: the Drin and its tributaries flowing into the Adriatic, the Vardar flowing into the Aegean Sea, and the Ibër on the other side that, as a tributary of the Morava, flows into the Black Sea. This serves to show the high altitude of the Balkan Peninsula above sea level. Even though the region is surrounded by high mountain ranges, the directions of the rivers show that the mountain ranges are separated from one another. In fact, there are few areas that can be called flat land in the full sense of the word. Most of the surface is hilly, but the flat land that there is, is fertile. It produces various types of grain, in particular those suitable to cold climates. It produces various fruits, in particular apples, pears, plums and other fruits of high quality. However, at the moment, due to a lack of population, many areas lie barren. Two events of great historical significance have made this plain well known. The first of these was the victory won by Sultan Murat I against the Serbs in 791 A.H. [1389 A.D.], on which occasion he put an end to the Kingdom of Serbia, and the second event was the defeat of the army of Hungary, Austria and their allies under the command of the Hungarian King Hunyadi in 852 A.H. [1448 A.D.] by Sultan Murat Khan II. This is a kasaba and capital of a kaza that stretches along the Reka [Erenik] river that flows into the White Drin. It forms part of the Vilayet of Kosova. It is situated 35 kilometres to the southeast of Peja and 30 kilometres to the northwest of Prizren, but belongs to the Sandjak of Peja. It has 17,000 inhabitants. In Gjakova, there are 16 mosques, 2 medresa [religious schools], 1 rushdiye [secondary school] and several sibyanmektebe [elementary schools], one library, a church and a mekteb [religious school] for the Catholic and Orthodox population. It has about 1,000 shops, with inns and public baths. The population of Gjakova is known for the fact that it preserves its traditions, and is devoted to trade and handicrafts. They make beautiful costumes and braiding, and produce slippers and shoes, etc. The kaza of Gjakova comprises 149 villages, most of which are considered to be part of the Malësia [highlands] because they are situated in the mountains. The population is courageous and skilled at bearing arms. The number of inhabitants is not known for sure, but it is estimated at about 25,000. In the Malësia, one household can have up to 40-50 members who are skilled at bearing arms. Only one-fifth or one-sixth of the people are Catholic or Orthodox Christians, the rest are Muslims. This town has always given birth to famous scholars and professors, and many of them have come to the der-i seade to study. There are fertile plains and valleys, where maize, beans, wheat, oats, rye and barley are grown, as well as many types of fruit and vegetables. There are many mountains and much pastureland such that they raise many sheep, goats and other animals. This is a kasaba and the capital of a kaza in the Vilayet of Kosova. It is part of the Sandjak of Prishtina and stretches along a small river that flows into the Morava. It is situated 23 kilometres to the southeast of Prishtina. It has 4,500 inhabitants, two mosques, one church, 1 rushdiye, two iptidayye [elementary schools], and a well-stocked market. The kaza of Gjilan forms the southeastern part of the Sandjak of Prishtina. It borders to the northwest on the kaza of Prishtina, to the south on the Sandjak of Skopje, and to the northeast on Serbia. This kaza comprises 109 villages, most of the inhabitants being Albanians and Muslim, though there are some Slavs. There are about 30,000 inhabitants in all. The land is generally mountainous, though there are plains, fields and fertile valleys. It borders to the southeast on the Karadak [Mali i Zi / Crna Gora] Mountains, and it is separated from Serbia by the Gollak Mountains. To the west of it rise the mountains Zhegovc and Konijça. The rivers that flow down from the mountains on this inner side of the kaza form the Morava that continues its course northeastwards, enters Serbia and flows into the Danube. To the northeast of the kaza, there is an area of 25,000 new dynym [dynym = ca. one thousand square metres] covered in forests, and this region covers the country’s needs for building material and firewood. The soil is very fertile and, aside from the various types of grain that grow here, they also grow hemp that the locals use to make a type of hide from which they make clothing. There are mineral spas in this kaza, as well as many ruined churches and fortifications. 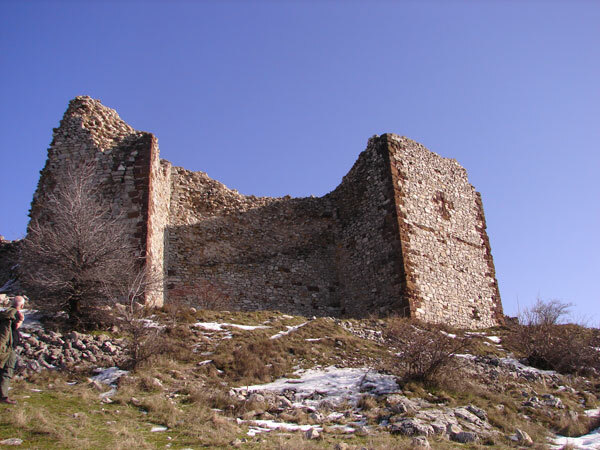 Not far away, to the north of the kaza, are the ruins of the castle and kasaba of Novobërda [Novo Brdo] that reveal that it was very important at the time of the conquests of Sultan Murat I in Kosova. This is situated in a gorge 35 kilometres to the northwest of Skopje. It is part of the Vilayet of Kosova but belongs to the kaza and Sandjak of Skopje. It is situated along the river Lepenc that flows into the Vardar, taking its course through the valley that separates the Sharr Mountains from the Karadak [Crna Gora] Mountains. This is where the railway line comes through from Salonika to Mitrovica. To the north, at some distance, where the river Lepenc merges with the Nerodimka, there is a village of the same name. Here there is a railway station and nearby are the ruins of a fortress. The gorge, stretching to the aforementioned village, is at an altitude of 525 metres and on the south side, it opens out onto the plains and valley of the Vardar. This is a mountain in Kosova, to the northeast of Skopje. It begins at the Gorge of Kaçanik, across from the end of the Sharr Mountains and stretches to the border of Serbia and separated Gjilan from Kumanova. The highest peak is 1,452 m. The Morava river takes its source in these hills and flows into Serbia. This is the capital of a kaza and belongs to the Sandjak of Prishtina. It lies 38 kilometres to the northwest of Prishtina, on the right side of the Ibër river, where the little river Sitnica flows into it. It is a kasaba of the Vilayet of Kosova. In Mitrovica there are three mosques and one prayer house. There are rushdiye and iptidayye and about 5,000 inhabitants. Above the town are the ruins of a fortress. The railway line from Salonika to Bosnia stops here. The kaza of Mitrovica stretches to the western edge of the Sandjak of Prishtina. To the south it borders on the kaza of Vushtrria [Vuçitërn], to the northeast on Serbia, and to the northwest on the Sandjak of Yeni Pazar. It includes 170 villages with Albanians and Christians. Most of the inhabitants are Muslims. It is a primarily mountainous terrain, but there are fertile valleys and plains. It is rich in forests, with pines, firs and other types of trees from which they make strong beams. In the field of agriculture, they produce all kinds of grain, vegetables and fruit. They also make excellent millstones here that are exported to other countries. There are many farm animals. Three hours from the capital of the kaza there are mineral baths that are very effective in treating a number of illnesses. It is known by the name of Banjska. This is a town in the northern part of Arnautlluk [Albania] and is the capital of a sandjak forming part of the Vilayet of Kosova. It is situated 75 kilometres to the northwest of Prishtina and 110 kilometres to the northeast of Shkodra. It lies to the southeast of a range of mountains known as the alps, that begin in Shkodra, in Albania. It is built in the valley of the White Drin. In Albanian and in Slavic it is known as Peq [Pec]. It has 18,000 inhabitants all of whom are Muslims. There are ten mosques, two medresas, one rushdiye school, about ten sibyanmektebe, one government konak, one barracks, one public baths, 550 shops and storage houses, and ten inns. The largest and architecturally most precious mosque is the one built by Sultan Mehmet Khan II. Peja is rich in flowing water and has a good climate, with fine vineyards and gardens. Above the kasaba is an old church, and about two hours away on foot is a monastery known as Deçan. The population is entirely Albanian and they hold religiously to their ancient traditions. They are known for their ponderous nature. Since ancient times, the town of Peja has produced rifles, guns and other weapons. There are many tanners and they produce many shoes and slippers. The kaza of Peja is part of the sandjak of the same name. It borders to the east on the Sandjak of Prishtina, to the south on the Sandjak of Gjakova, to the west on the elayet of Shkodra and the kaza of Gucia [Gusinje], to the northwest on the kaza of Berane, and to the north on the Sandjak of Yeni Pazar. It contains 200 villages. Due to the lack of reliable statistics, the exact number of inhabitants is not known, but it is known that in this kaza there are large families and a population of somewhat less than 150,000. These Gheg mountain people have their own form of society. They are attached to their tribes and recognize their tribal elders. They pay particular attention to the bloodline among them. Most of the terrain is mountainous and the flat land is sandy. Agriculture is very backward. The region is known for its apples and other fruit. The Sandjak of Peja is situated in the western part of the Vilayet of Kosova, on the edge of northern Arnautlluk [Albania]. It consists of the kazas of Tërgovishta, Berane, Gucia, Gjakova and Peja. To the north it borders on the Sandjak of Yeni Pazar, to the west on Montenegro, to the southwest on the Vilayet of Shkodra, to the south on the Vilayet of Monastir and the Sandjak of Prizren, and to the east on the Sandjak of Prishtina. As to the terrain of this sandjak, it is primarily mountainous. From the southwest to the northeast stretch the Albanian Alps, Mokra and Suka that form part of the territory of the sandjak. Only the kazas of Gucia and Berane, on the northwest side of the above-mentioned mountain range form part of the water basin of the Lim that flows into the Danube. The other kazas to the southeast of the mountain range are connected to the Adriatic. This includes most of the land to the north of the water basin of the White Drin. Both sides of these mountain ranges are rich in forests and pastureland. There are also rocky crags. The population is mainly active in herding. Between the mountains and along the rivers there are fine valleys and fields. Agriculture is not highly developed here, although the land is fertile. It has remained backward. They produce various types of grain and very good fruit. In the towns of Peja and Gjakova, they produce arms, silverware, Albanian national costumes, and silken garments. In both of the aforementioned towns, there is much trade. Butter and excellent cheese are produced in the mountains. The exact number of inhabitants is not known because the census was not carried out properly, but one can estimate that there are 159,000 inhabitants in this sandjak. Most of the people are Muslims. There are few Christians and they are divided into Catholics and Orthodox. The population is Albanian. Only in the kazas of Gucia and Berane does a part of the population speak the Bosnian language, but they know Albanian just as well. As for their customs and traditions, they are no different from the Albanians. The people of the whole sandjak, in particular the mountain inhabitants of Peja and Gjakova, are exceptionally courageous and warlike, in particular with regard to their customs and traditions that they defend fanatically. View of Prishtina in the 1930s. This is a kasaba situated in the northeastern part of Arnautlluk [Albania]. It is the capital of a sandjak forming part of the Vilayet of Kosova. It is also the residence for the vilayet and lies to the northwest of Skopje, at a distance of 80 kilometres, and is about 10 kilometres to the east of the railway line from Salonika to Mitrovica. It is finely situated at the point where the mountains end and the plain of Kosova begins. It has 10,638 inhabitants, of whom 8,165 are Muslims, the rest being of other faiths. Although the population is wholly Albanian, Turkish is widely spoken in the kasaba. Prishtina has thirteen mosques, five prayer houses, two medresas, one rushdiye, two iptidayye, one for boy and one for girls, several sibyanmektebe, three pubic baths, a military hospital outside the town, about 500 storehouses and shops, and ten inns and guesthouses. Of the mosques, three are large, one of which was begun by Sultan Murat Khan II and finished by Sultan Mehmet Khan II. The other one was built on the orders of Sultan Mehmet II the Conqueror. The third one was built by a local family, that of Jashar Pasha. The kasaba produces a pleasantly fragrant soap. This kasaba was originally the capital of the kaza, but with the creation of the Vilayet of Kosova, it became the capital of the whole vilayet, and remained capital of the sandjak after the vilayet capital was transferred to Skopje. Half an hour away from Prishtina is the site where Sultan Murat I fell as a martyr to the faith. There is a splendid tyrbe [mausoleum] at the site. This is one of the six sandjaks forming the Vilayet of Kosova. It border to the south on the Sandjak of Skopje, to the northwest on Yeni Pazar, to the west on Peja and the Sandjak of Prizren, which is part of the Vilayet of Monastir, and to the south on the Vilayet of Monastir. It stretches for a distance of about 120 kilometres in a southeast to northwest direction and has a width of about 65 kilometres. It is mostly flat. It borders to the east and northeast on Serbia where there are mountains, and to the southwest on Sharr Mountains. Between these is the Lepenc river that flows through the Gorge of Kaçanik. There are mountains to the northwest, too. Most of the fertile flat land is on the plain of Kosova, that stretches out as a plateau and is most productive. Although germination is excellent, little of the land is cultivated. The sandjak is a plateau and is divided into three water basins. Most of it, flowing from Yeni Pazar, is gathered by the Iber, that collects the waters of the Sitnica, and enters Serbia, flowing into the Morava river. The Sitnica, that flows through the plain of Kosova from south to north, includes the Drenica and many other streams. The separate southeastern water basin of the sandjak also enters Serbia and, together with the waters of the Morava river, and flows into the Danube. This river, the Morava, separates the Sandjak of Skopje from the Karadak region, taking several small streams with it that flow northwards. It enters Serbia near Vranje. In the southwestern part, there is also the water basin of the Vardar that collects the waters of the Nerodimka and the Lepenc, flows through the Gorge of Kaçanik, and continues onwards to the Aegean Sea. The soil of the sandjak is fertile. Although agriculture is not particularly developed, there is enough produce to meet the region’s needs, and a large part of it is exported. Indeed, there are many good types of fruit. There is also much forest and pastureland and for this reason, the people herd sheep, cows, horses and other animals. The cattle are of a hardy race. The people produce and export butter and other dairy products. As to handicrafts, they are known for their manufacture of garments, carpets and rugs made of cotton. The railway line from Salonica to Mitrovica divides the plain of Kosova into two. The population of the sandjak is about 220,000. Over two-thirds of the people are Muslims, the others being Catholics, Slavs and others. (…) As seen in the overview below, the Sandjak of Prishtina consists of five kazas encompassing 860 villages. The kaza of Prishtina alone, that is, including the capital of the sandjak of the same name, has 241 villages. The number of inhabitants is 60,993 and almost all of them are Muslims. This is one of the largest towns. It is the capital of a sandjak that is part of the Vilayet of Kosova. It lies to the west of the Sharr Mountains, along a river called the Bistrica, a tributary of the White Drin. It is situated 55 kilometres to the northeast of the capital of the vilayet, Skopje, 140 kilometres to the northwest of Monastir, and 125 kilometres to the east of Shkodra. It is a beautiful town with 38,000 inhabitants, and has a large market, 24 mosques, a large number of medresas and one rushdiye. Above the town, there is a mighty fortress, an ancient castle adapted as a government konak. There are many streams, several bridges, 100 shops, a number of workshops for the production of arms, scissors, knives and other metal objects, a workshop especially for the production of silver, several tanners and a flourishing commerce. The population is Albanian, most of whom are Muslims. The others are divided among Orthodox and Catholics. There are also a few Vlachs [Aromunians] and Slavs. The inhabitants are devoted to trade and commerce and to handicrafts, and they are known for their particularly resolute and unyielding nature, and are said to be prone to rebellion. Before the Ottoman takeover, when it was under the control of the Serbs, it served for a time as a royal residence. When it was conquered by Sultan Murat I, and then by Sultan Mehmet Khan II, it served as a centre for the eastern part of Ghegeria and then became the capital of the vilayet. Also, after the creation of the vilayet, it was on several occasions the residence of the vilayet. It was formerly part of the Vilayet of Monastir and recently became part of the Vilayet of Kosova. This is one of the six sandjaks that make up the Vilayet of Kosova. It is situated in the western part of this vilayet. This sandjak once included Gjakova and Peja, since it extends in the direction of Montenegro. Now it is a small sandjak consisting only of the kaza of Prizren itself, Luma and Tetova. However, it has 400 villages and about 260,000 inhabitants. With the exception of a small portion of Christians living in the town of Prizren, all the rest of the people are Albanian Muslims. The inhabitants of the towns of Prizren and Tetova speak Albanian and Turkish. The Sharr Mountains divide this sandjak into two. The western slopes of the range are not suitable for agriculture, but the eastern and northern sides of the Sharr are very fertile. They produce many crops, including various types of grain, grapes, and other high-quality fruits, and in great quantities, too. To be mentioned in particular are apples, pears, plums, peaches and other fruits. In Istanbul, they sell apples imported from Prizren and Tetova that are known as arnaud elmasi (Albanian apples). They also produce very good drinks. The kaza of Prizren, including the town and 190 villages, is a large kaza stretching along a fertile plain to the northeast, including Rahovec. The soil is exceptionally fertile and is well known for local fruits. This is a kasaba and the capital of a kaza in the Sandjak of Prishtina and in the Vilayet of Kosova. It is situated on the plain of Kosova, 27 kilometres to the northwest of Prishtina. It has about 4,000 inhabitants, 14 mosques and prayer houses, 2 medresas, rushdiye and iptidayye schools, a ruined fortress, a solid bridge over the nearby Sitnica river, and a railway station, half an hour away. The kaza of Vushtrria borders to the east and southeast on the kaza of Prishtina, to the west on the Sandjak of Peja, to the northeast on the kaza of Mitrovica and on Serbia. It encompasses 325 villages with 25,000 inhabitants, of whom 5,000 are Christians and all the rest are Muslims, and all of them speak Albanian. The soil is quite fertile. They grow all sorts of things: good apples, pears, plums, peaches and other fruit, as well as watermelons, etc. There are extensive forests covered in mighty trees. In the winter, the weather is cold, but it is very pleasant here in the summer.